Whenever I feel like walking down memory lane, I reach for a Kelly Bennett book. Bennett’s latest, One Day I Went Rambling, is great for just such a walk. It’s the story of rambunctious little Zane, an adventurous soul whose friends think he’s a little zany because he loves rambling around for old treasure. But Zane’s finds don’t come from abandoned mines or at the bottom of the sea like your typical treasure troves; they come from empty lots, cluttered junk yards, and even granny’s wobbly clothes line! When Zane finds a shiny flying saucer’s crest, a friend reminds him it’s only an old hubcap. When he finds a twirling lasso, another friend reminds him it’s only a vine. But no matter how many times his friends try to bring him back to reality, this little dreamer doesn’t let their words bother him. He knows treasure when he sees it, and that’s a fact! As always, Bennett’s style is imaginative, super-sweet, and just whimsical enough to leave you longing for the good old days. Illustrator Terri Murphy adds her own touch by using her signature warm and bubbly colors and sketching high-adventure scenarios that readers will remember long after they turn the last page. This is a lovely book, and a perfect installment in Bennett’s growing line of nostalgia-tinged children’s books. This one is great for lap time, play time, art class, and even “recess,” if such a thing still exists. And if it doesn’t, this book is sure to revive it, because with this book, Bennett manages to do something that nobody else seems to be able to do these days: she gets children to go outside and play! Isn’t that wonderful? 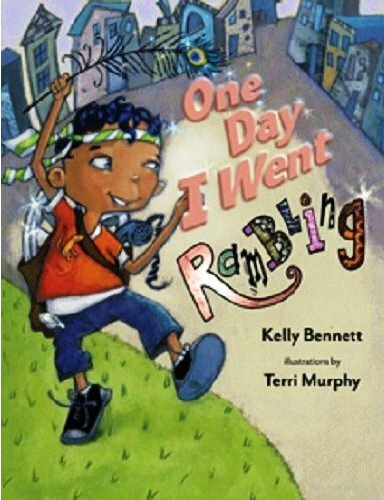 For a book that will speak to your child – and will speak to the child in YOU – be sure to pick up your copy of One Day I Went Rambling, by Kelly Bennett. And be sure to follow Kelly Bennett as she, Zane and the gang ramble along on her book tour from June 8 to June 22. The details are below! Next articleHow? The Most Awesome Question and Answer Book About Nature, Animals, People, Places – and You! What a great review. I had an opportunity to read “One Day I Went Rambling” and I thought it was a fun book. I remember well when my boys would pick up something that others would think was junk and find a “treasure” instead. Glad you enjoyed the review. Kelly Bennett’s books are so easy to love. I only wish they had been around when my sons were young. Yeah! Thanks for the Picture Book Depot Illustration Award–I’m with you, Rita Lorraine, Terri’s illustrations are so full of life, with all those details to discover–a ramble for the eyes! We sure appreciate you helping us celebrate by being part of LGRBT 2012! Toot-Toot!